But desperate times call for desperate actions-if we don't save some seed of our favorite, vanishing hybrids, they will be gone forever. I am now going to encourage you to save seed from hybrids mainly because of the problems we are experiencing with the commercial seed companies discontinuing the production of the favorite Texas varieties. All of these problems are explained at: http://www.plantanswers.com/veg_varieties.htm Since we have tested and selected absolutely the most adapted, reliable producing varieties for this area, if we save seed from hybrid vegetables which absolutely "won't produce exactly the same in the next generation", the saved seed will still be a great deal better than other non-adapted hybrids which we will be forced to use because of the non-availability of our favorite hybrids. The Tomato Celebrity is not known as a heat-setting tomato but is acceptable if fall temperatures cool early in the season. 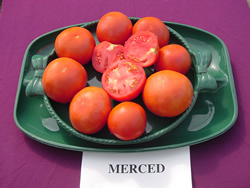 The Tomato Merced is not a heat-setter but was a favorite of many Texas gardeners--it is no longer available. Granted, it is difficult for the home gardener to isolate varieties to avoid unwanted cross-pollination. 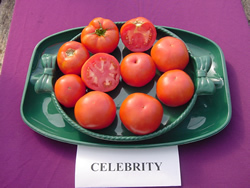 However, tomatoes and peppers are 85 percent self-pollinated and crossing seldom occurs on the first fruit set of the plant. If you plant only recommended varieties in close proximity, the small percentage of crossing could conceivably result in a better selection than the original hybrid. So to insure optimum results, choose the first fruit which ripens on the plant which has the qualities (yield, foliage, health, vigor, etc.) which you want to maintain in the seedling selections. It is true that self-pollinating a hybrid will result in the gradual deterioration or "running out" of the original qualities of the hybrid but, if careful selection is used, this process can take 5-10 generations. Following are some simple directions on how to save seed from your favorite tomato: Allow the tomato fruit to thoroughly ripen on the vine. Cut the tomatoes open and remove the seed by squeezing or spooning out the pulp with seeds into a non-metal container such as a drinking glass or jar. Set the container aside for two or three days depending on the storage temperature, i.e., the hotter the location, the faster the fermentation. You want to clean the pulp from the seed before the seed begins to sprout-although some sprouting doesn't not completely ruin the batch. The pulp and seed covering will ferment so that the seeds can be washed clean with a directed spray of water into the fermented solution. The clean, viable seeds will settle to the bottom of the solution, allowing the sediment to poured off. Several rinsings may be necessary. Then spread the tomato seed out on a newspaper to dry in a sunny, hot location so they can dry rapidly before they sprout. After seed are dry, scrap off of the newspaper with a blade and package, label and date for storage in a cool (refrigerator), dry location. Definition - What does Open Pollination mean? Open pollination can be carried out in two different ways. The first way is through an external means such as birds, insects, water, or wind. The second way is through self-pollination, which occurs when the male and female parts are contained in the same plant. As long as pollination occurs between the same varieties, the seeds produced will be true to the parent seeds year-after-year. This is in contrast to plants that have been cross-pollinated, which can have a variety of characteristics. Gardeners often isolate cross-pollinating plants from different varieties so they do not become pollinated by another variety. However, plants such as beans, peas, tomato and lettuce are self-pollinating and do not require isolation. The seeds from these plant types are the easiest for home gardeners to save, as they remain “true” from year to year. Open pollinated varieties are usually grown in fields where they self and cross-pollinate. Wind and insects carry the pollen from one plant to another. Plants that cross-pollinate must be isolated from other plants of different varieties so they will produce seed that is "true to type." Beans, lettuce, peas, and tomatoes are self-pollinating so they are easier to continue year to year without having to isolate them from other varieties of plants.